BRIGHT SHADOW = The glowing, looming presence of that thing we love to do most but avoid doing because it means so much to us. It may, in fact, be our greatest gift; but we may not believe we can succeed, or that we deserve to have what we want. Or perhaps we fear failure. Often we think ‘other people can do these things, but not me.’ We admire or are even jealous of the people who have stepped into the spotlight and are doing what we long to do – the place where we most desperately long to go. The only thing holding us back is our fear. The BrightShadow Publishing Company was founded in celebration of this very real -- but often unrecognized -- aspect of human nature. Kristina Hutch Matthews felt an intense calling to tell stories and share artwork that offered the wisdom she has worked so hard to integrate into her life. For many years, in spite of this great desire, she pursued other goals and other ways of serving because they were more easily accessible and seemed easier to accomplish. Though Kristina felt some satisfaction from each of the other pursuits and learned a great deal from these experiences, there was always something missing. 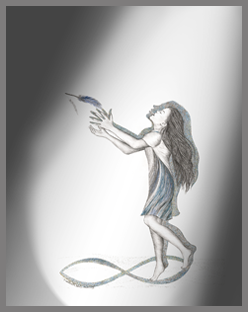 She longed to write and illustrate the stories that she was “downloading” from Spirit. But even when she made the time to complete mock-ups of her first two illustrated books, she still felt overwhelmed with the undertaking of bringing her books into published form. Finally, in the beginning of 2014, Kristina fully realized the deep truth that YOU HAVE TO BELIEVE IN YOURSELF BEFORE ANYONE ELSE WILL. In this spirit of self-reliance, she stepped boldly into the area of her bright shadow, founding BrightShadow Publishing Company, and publishing her first picture book, The Cat Flap: A Tale of Harmony and Balance. There are many more books to come. Kristina hopes that her story can serve as an inspiration to others who share this dream, and looks forward to guiding others on their journey to give birth to their own creative and literary projects.